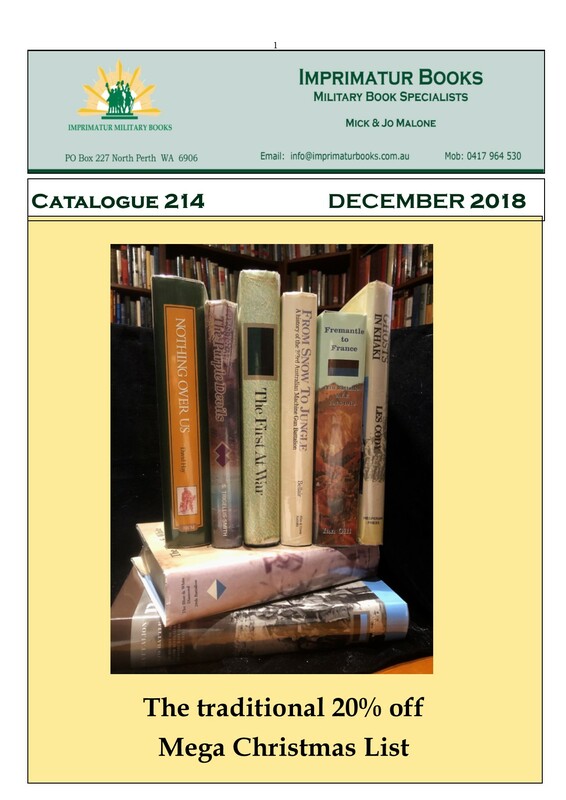 Welcome to Catalogue 214—our 20% off Christmas list. This is our biggest list ever and represents most of the most desirable books in our collection. There are some very serious ‘hard to find’ unit histories contained herein. I ‘m loath to use the word IMPOSSIBLE when I talk about the difficulty in finding them. RARE even VERY SCARCE means they are out there somewhere and not IMPOSSIBLE to find. The chase has always been the best thing in book collecting and I still get a real buzz from it. Unfortunately, many of the avid collectors have gone to their reward. Many of the younger generation are yet to discover the fun of collecting books. They’d rather their lap tops, iPads and phones to read books on all sorts of subjects, mores the pity. As I’ve said before, there’s nothing to compare to the tactile nature and smell of a book. As we head in to the ‘silly season’ of Christmas and all the over indulgences that tends to bring, spare a thought for our deployed soldiers in far flung lands (which I tend to think, we shouldn’t be, my opinion only. They’ve now been deployed longer that WW1 and WW2 combined). So, on books, my advice is get in on this lot early because the usual ‘Christmas 20% off’ offerings fly out the door. MERRY CHRISTMAS everyone and mind how you go.